John Jenkins Peacock was born in Sydney in 1798, son of Thomas and Elizabeth Peacock. On 8 February 1827, he married Maria, daughter of Thomas Parsonage and Mary Jones (both convicts), at St Phillip’s, Sydney. John and Maria Peacock had two sons and two daughters. He died at Fendale Town near Lyttleton, New Zealand, on 29 July 1868. His wife Maria died on 19 September 1884, aged 79. They are buried with their family in Barbados Street Cemetery at Christchurch, New Zealand. Two convicts named Thomas Peacock are recorded but which of these was John Jenkins father is unclear. John Jenkins Peacock began adult life as a Hawkesbury farmer with a grant of 250 acres at Lower Portland. He acquired his master’s ticket and engaged in coastal trading with his brother-in-law Michael Gannon. By 1821 he was building a vessel at Cockle Bay and by 1823 had small vessels trading to the Hawkesbury. In 1834, he moved to Market Wharf in Sydney and in 1837 bought Bettington’s Wharf and Stores. He owned the barque Sir William Wallace and other vessels, traded with New Zealand where he bought wharves and land, and he also had land on the Parramatta River and the Hunter Valley. He was a licensee of the Dundee Arms in Gloucester Street in 1840. In 1842, he was appointed a director of the Union Assurance Co. 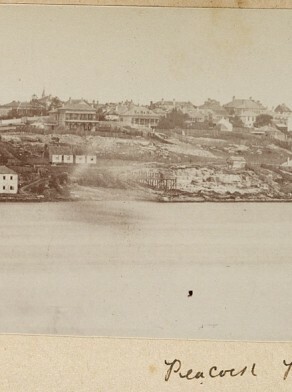 In 1836 he bought four acres of the first sub–division of Balmain, opposite his Miller’s Point wharf. In 1841 he offered 38 lots for sale but not enough were sold to save him from insolvency on 2 September 1843. He was forced to surrender all of his city and country property, his shipping assets, and his house and goods. He remained in business at Windmill Street and later Victoria Terrace, Miller’s Point until 1867. He moved to Lyttleton in the South Island of New Zealand and traded under his sons name as J T Peacock and Co. His name is commemorated at Peacock Point at Balmain, by Peacock Hill in the Hunter Valley, and also in New Zealand. John Jenkins Peacock was Foundation Councillor for Gipps Ward, 1 November 1842 to 20 September 1843 when he became insolvent and was disqualified from holding office.